We had full-time jobs. We didn’t pay much attention to those flower beds other than to give them a glance when we had parties in the backyard or to pick the lovely peonies on the back walkway that someone else had planted ages before we lived in that house. So, one day I took advantage of my unusual work schedule and dug in. I remember not getting very far before my back was burned and my legs and back were thoroughly tired. I thought to myself, “This is why you weed more regularly.” I just hated seeing someone’s beautifully planned-out garden getting choked because I was too lazy. Then the neighbor lady from the house whose yard backed up to ours came back and thanked me for weeding. She was so nice about it, but she couldn’t help but tell me that the garden had indeed been the pride and joy of the owner who had planted it long before. One other thing the neighbor lady mentioned. The tree growing in the front bed, right under my bedroom window? I don’t remember how we got that thing out. However, we did it because we knew if it was left to grow much longer it would be even harder to take out. We didn’t want to be responsible for ruining the foundation of our rental house. So yes, a weed tree is a very big deal – potentially. 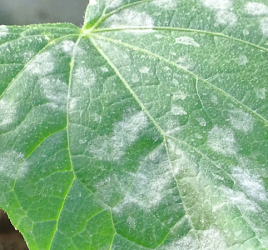 You should have an idea of how to identify them and get rid of them before they ruin your property. Don’t learn the hard way like I did. Weed trees are definitely trees, just to clear that up. They are a species of trees or varieties with high seed germination rates, which grow rapidly and colonize quickly. They tend to choke out other tree species which are slower growing if you’re not careful. These guys come to your flower beds, lawns, and tucked-away corners via nearby trees, wind, birds, and animals. They are usually planted as ornamental trees and are not native to the areas in which they grow. The problem is what causes them to be chosen as ornamental trees are their biggest drawbacks: they are hardy and hard to kill. Any tree that is unwanted can be a weed. If you have a tree starting up too near the foundation of your home, you want to get rid of it even if it is a tree. Ultimately it’s not good for your home or the tree to be planted there. 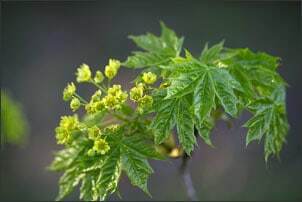 Norway maple trees were planted as street or park trees when Dutch elm disease wiped out our country’s elms in the 1960s and 70s. They adapt well, they like shade, and they grow to a huge size – 40 to 50 feet. They have winged seeds that spread over a large area. Norway maples will take over wooded areas and hedgerows if you let them. Norway maples are very pretty – they turn yellow in the fall. By all means, keep one around if you want one. Just be aware that you will have to watch out for volunteer seedlings all over your property. The black locust is native to the Appalachian region and the Ozarks of North America. It is a medium-size tree that has fragrant white flowers in clusters in the spring and feathery leaves in clusters in summer. They grow up to 50 feet with a narrow canopy. 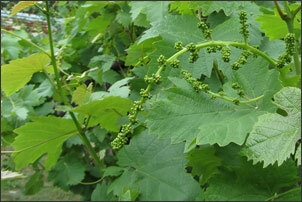 They self-seed easily and therefore have become an invasive species even in their native areas. Once established, black locust is difficult to control. 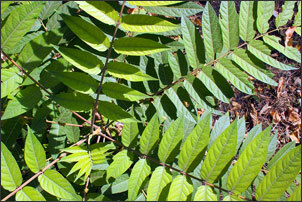 The tree of heaven is native to China. It was first introduced to the United States from England as an exotic, fast growing, ornamental shade tree in Philadelphia, PA in 1784. 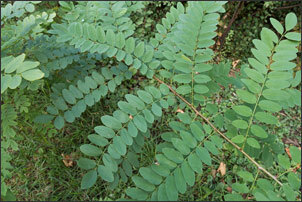 It has groups of leaves, gray bark, and a spreading canopy. It can grow up to five feet per season and grow as tall as 60 feet. It has an unpleasant odor when you cut it down. This tree multiplies by root suckers which spring up around the base of the trunk. The white mulberry tree is also native to China. They have orange-brown bark and sweet, edible berries which birds will spread far and wide. White mulberries adapt and grow well in a wide range of conditions and stubbornly grow wherever – even springing new shoots from trunks or roots of felled trees. Sound like a great attribute? It is, but that makes a mulberry very difficult to eliminate from your yard. 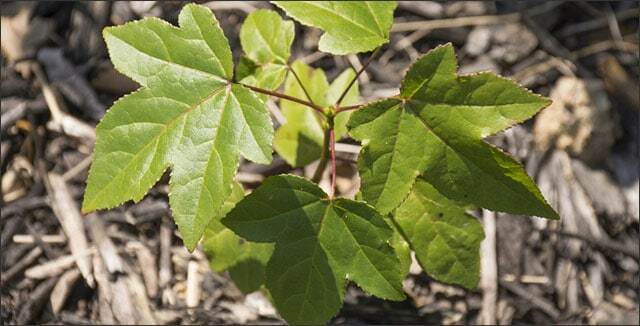 The number one easiest way to remove a weed tree is to pull it up as a seedling. 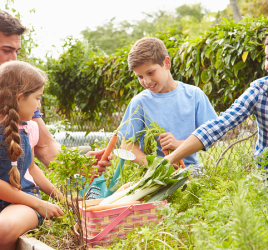 Therefore, it makes sense to walk your yard – especially if you have hidden little nooks and crannies – when the ground is damp and pick out any possible seedlings you find. Even the end of the summer may be too late for this job to be easy. If you have waited too long or just didn’t discover your weed tree until it has become too large, there are a few different methods. Paint. You can cut down the canopy and paint the cut part with regular paint to kill the rest of the weed. Bark Peeling. A tree gets its nutrients to and from the root system right under the bark. If you peel away its bark, this will eventually kill the tree. But it might be too slow or arduous a way to get rid of a pesky tree. Chemicals. There are chemicals you can buy specifically for this purpose, but I’ve also heard of household bleach doing the trick when painted directly onto the cut surface of the tree – without killing the surrounding vegetation. 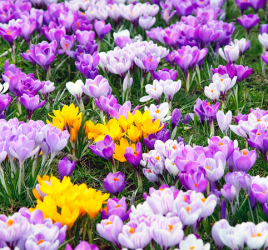 However, with any chemical, there is always the chance of either killing surrounding vegetation and/or making the ground infertile for some time afterward. Salt will definitely kill your tree. Unfortunately, it will also make the ground infertile. Sometimes you have no other choice. Pickup Truck and Chains. If you have friends and a good pickup truck, it is possible you could pull the trunk right out of the ground. However, if it is growing close to the foundation of your house, this is not the right method. Weed trees are any kind of tree that is growing in the wrong place at the wrong time or invasive species that can choke out other native vegetation. If you have a weed tree in your yard, pull it up while it’s still a seedling. Learn to recognize the signs that you have weed trees sprouting and you will save yourself a huge hassle later on. On the other hand, if you have a tree that you would like to flourish, consider installing Rootwell’s Pro-318 Deep Root System. Pro-318s are porous cylinders provide the distribution of air, water, and nutrients throughout the root zone.